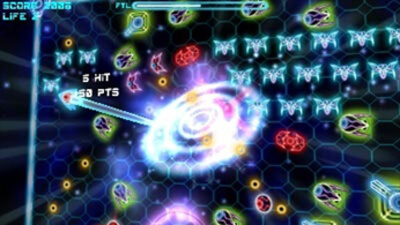 Hyperlight is an high intensity arcade action game in which you control a spaceship that fights against hordes of evil alien monsters in a virtual cosmic environment. Your spaceship has a special capability: it can travel at a Faster Than Light speed (F.T.L.) becoming itself the final weapon. By colliding with enemies in this state the ship can instantly destroy everything it touches! In the game there are also plenty of other bonus, weapons and entities that can help you overcome the many difficulties you'll be facing, including the battles against the terrific final bosses that await you in the dark side of the universe! 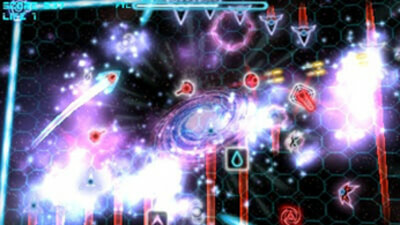 Hyperlight EX is a fun shoot-em-up high score chaser with an interesting hook. It's recommended for fans of the genre, but for those who aren't used to extremely challenging games like this it may prove to be too intense. Still, Overall it proves to be a worthy new entry in the 3DS library. 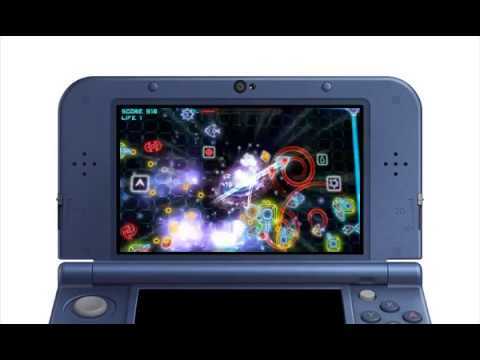 One of the best Schmup options available on 3DS, Hyperlight EX is a fun grab for only $6 dollars but the difficulty and lean modes might turn some players off.